Jadeite, Jadite, or Jade-ite? 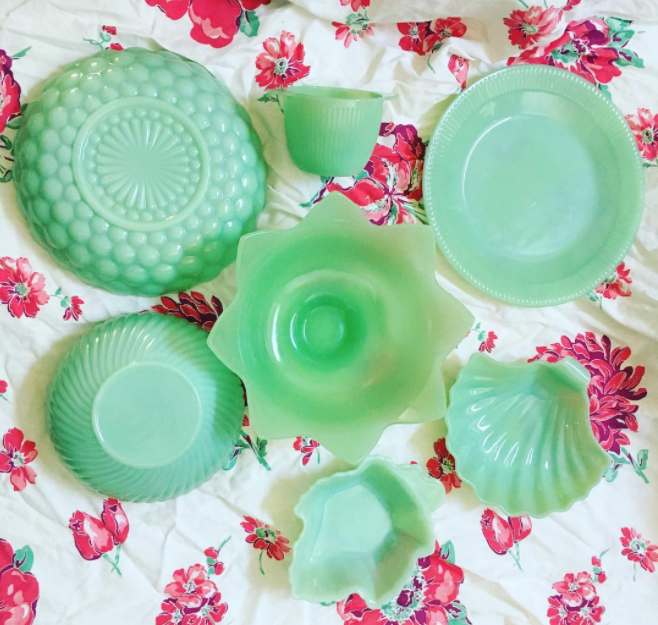 No matter how you spell it, jadeite is that gorgeous green milk glass found in old homes, estate sales, flea markets and antique malls all over the U.S. and Canada. First created in the 1930s, jadeite is used for all types of things, but most commonly dishware and kitchenware. 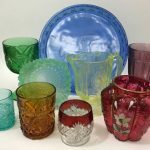 It first became popular in the Victorian era, then fell out of style for a time until World War II when glass companies found it could be stylish, plus affordable, to make. Now it’s trendy again. While jadeite is a collector’s favorite today, it was meant to be regular, utilitarian dishware for the everyday kitchen. The green color was added to existing glass formulas in order to to add a bit of color to people’s lives during the Depression. Seeing that cheery burst of color, glass makers hoped, would brighten people’s days a little. Turns out they were right. 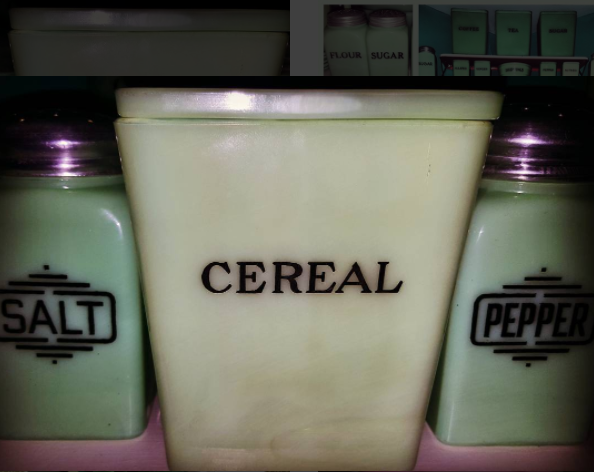 28 oz Jadeite McKee cereal canister, a fabulous find. Notice the lighter color. Photo by Laurie, who posts photos of her collection at @vintagepickerchick on Instagram. To purists, vintage jadeite is generally American-made from one of three major companies: McKee, Jeannette, and Anchor Hocking. Some discerning collectors only collect pieces from one of these three primary companies. Others decide any is fine, vintage or contemporary, as long as it’s made in the USA. Others still prefer an eclectic look, combining vintage milk glass with Fenton or clambroth for a unique mix. What’s great about collecting jadeite is pretty much anything goes. 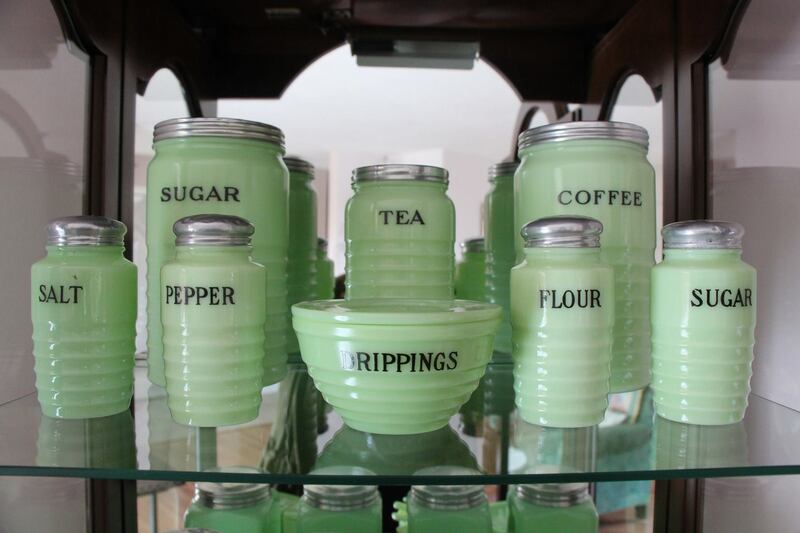 While kitchenware is most common, jadeite is also used in lamps, furniture, jewelry, hardware, and more. And just as with vintage Pyrex, collectors don’t confine their pieces to the kitchen. They also love to display them in hutches, as well as around the house. 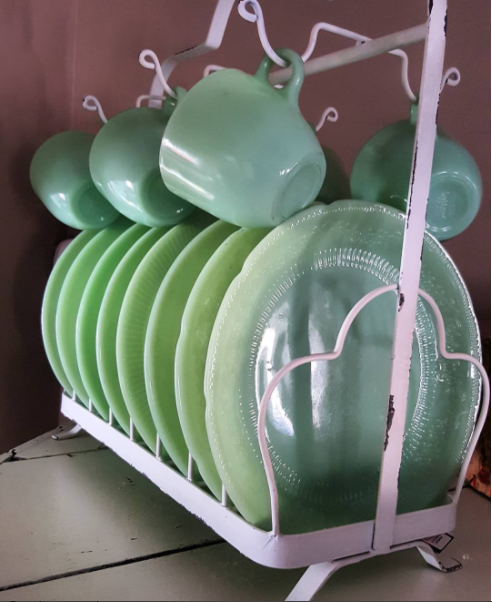 Collectors also can get creative with the ubiquitous, and often cheap, jadeite saucers, transforming them into DIY projects, like tiered cake stands, or using them as jewelry trays. 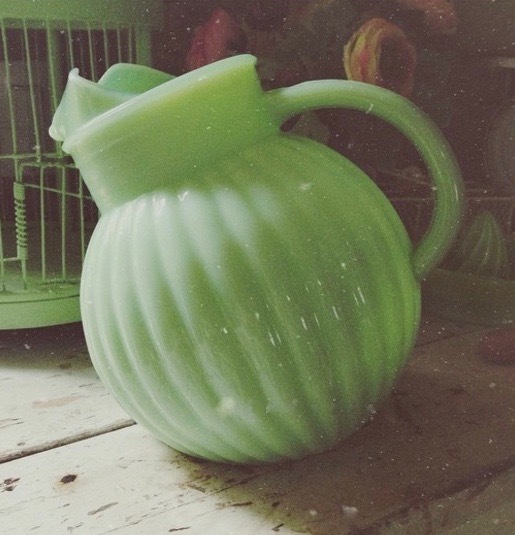 Besides its gorgeous green hue, what made jadeite popular during the mid-century as well as now is its durability. Made to withstand high temperatures and built to last, jadeite isn’t just fancy form over function. This durability is one reason it’s stayed fashionable as long as it has, and why you can still find it intact “in the wild” today. 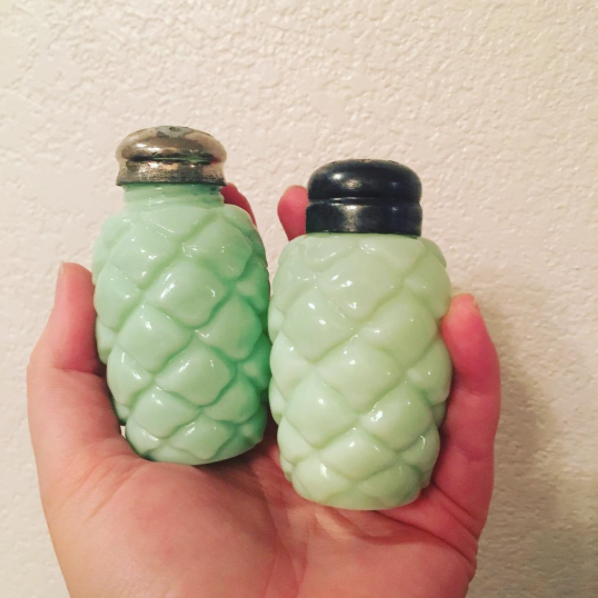 EAPG, or Early American Pressed Glass, existed in the late 1800s to 1915 and created light jade-colored pieces like these two antique sugar shakers. EAPG jadeite is rare and sought-after. Photo by Megan who posts great photos on Instagram as @jadeiteaholic. In 1932 Pennsylvania-based glass company McKee discovered that by adding green glass scraps to their signature milk glass formula, they could create a gorgeous shade of green. They called one shade “Skokie” and the other “Jade” (and later “Jadeite”), both popular collectibles today. Since there was no formal quality control, you’ll find pieces in all shades of green. Vintage McKee range sets and canisters are favorites, as well as the Laurel and Philbe patterns. Having the entire McKee range set is a goal for many collectors. You can tell repros from real sets by the lettering and the condition of the lids. Photo by Jo-Ann Benoit, a collector in Woodstock, Ontario. Jo-Ann is lucky enough to have two McKee Jadeite sets in skokie green. 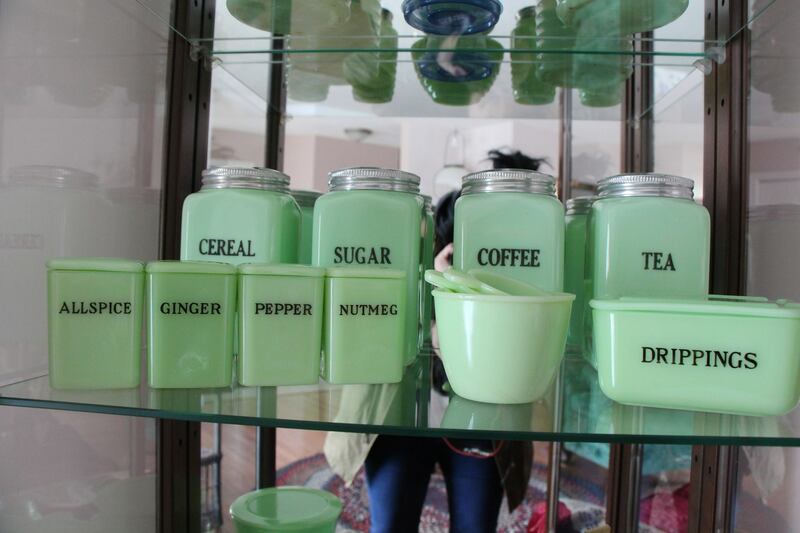 Vintage Jeannette spice canisters are pictured up front, in a slightly different shade of green. In the 1930s, another glass company called Jeannette also put out its version of jadeite they called “Jadite.” Early Jeannette pieces are marked with the letter J in a triangle. Unfortunately for newer collectors, a lot of Jeannette Jadite is unmarked, so knowing what to look for is key and only comes with studying and time. 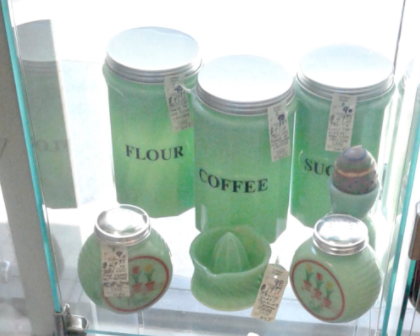 Jeannette made Jadite spice jars and vintage shakers as well as common kitchenware. Anchor Hocking only put out a few ball jugs which might account for their high value. This is a repro ball jug (as most floating out there are), but it still looks pretty good! Photo by Melissa who has a lovely Instagram account at @jadeitejunkie. Later came Anchor Hocking, the glassware company that made Fire-King and still exists today. Anchor Hocking created its own line called “Jade-ite” (adding the hyphen). 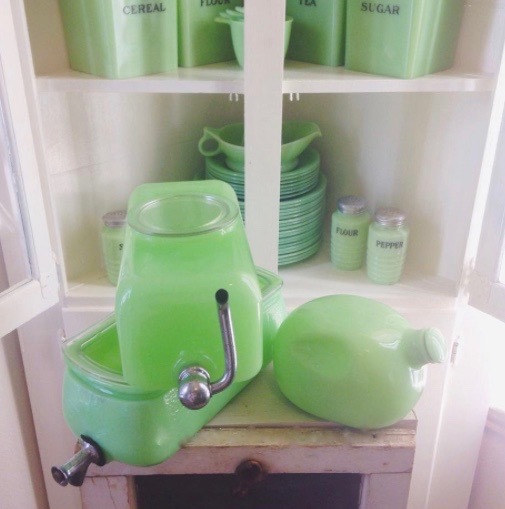 The new green glass included Restaurantware, a heavy, hard-to-find collector’s favorite. Popular Fire-King Jade-ite bowls include the beaded mixing bowls and batter bowls, plus their coffee mugs, dishware, butter dishes, and more. Fire-King patterns to look for are Jane Ray, Alice, Charm and Shell. And don’t forget the highly sought after Fire-King Jade-ite ball jug, which first debuted in the 1940s and can go for hundreds of dollars today. The original Fire-King ball jug was made in the patterns Target (also called Bullseye), Manhattan, and Swirl. Anchor Hocking also made a 2000 line (which will one day soon be vintage!). One can easily tell vintage Fire-King from modern. Newer pieces are made from new molds and are marked Fire-King 2000. The Alice pattern on these Jade-ite dishes is a pretty, feminine design by Fire-King during the 50s and 60s. Photo by Laurie. All collectors have their own reasons for wanting a piece of jadeite. Some collectors love the history of it, how it was literally designed to make people happy. Others take pride in buying American, whether because it’s patriotic or because of its reputation for being well made. Some love the nostalgia it inspires, bringing back childhood in the 1950s and reminding them of the past. Others still just like how it looks, which is probably why most people collect jadeite. 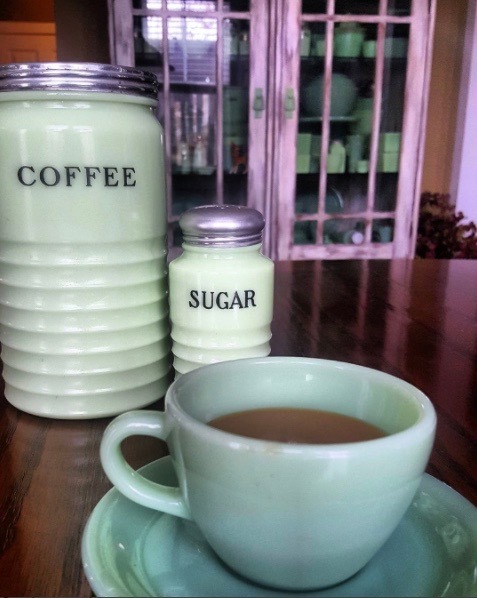 There’s just something so attractive about its milky green color, whether used to serve food or set off as home decor. Sneath Glass was another early American company making jadeite, as seen in this rare Sneath jadeite water dispenser. The McKee pinch bottle to the right is another rare find collectors consider drool-worthy. Photo by Melissa. Several collectors get a kick out of (and long to return to) vintage jadeite’s clever marketing tactics. To spread the word and get housewives who did the grocery shopping to buy their products, household companies would stick a piece of jadeite in their packaging to offer an incentive to buy it again. For example, one measuring cup might be inside a bag of flour, enticing someone to complete the whole set. 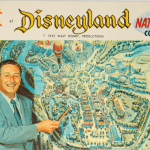 While promotional pieces were given away for free, these days they’re highly collectible and can go for thousands of dollars, depending on the price, maker, and overall condition. 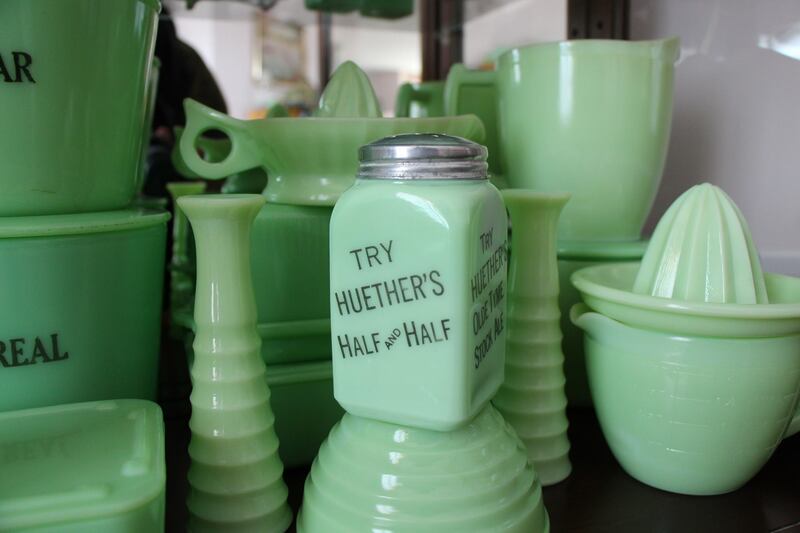 This cute jadeite canister was most likely found in packaging for Huether’s half and half. A sweet surprise when doing your baking. Photo by Jo-Ann. More jadeite promotional pieces to market a radio & electric company. If only! Photo by Jo-Ann. Fake Jadeite or Fantasy Jadeite? The deeper you delve into jadeite collecting culture, the more you’ll start to hear about fake or faux, as well as “fantasy” jadeite, a term some collectors find condescending. While neither fake nor fantasy are considered authentic vintage jadeite (from a purist’s standpoint), there are key differences among them. Fake or “faux” is what some collectors call reproduced or “repro,” anything made in 2000 or newer, whether in the U.S.A. or overseas. Companies like Martha by Mail (by Martha Stewart) and Cracker Barrel make contemporary jadeite that can look quite similar to the older stuff. These Martha by Mail jadeite cake stands look great, which makes some collectors scoff at the idea of only acquiring vintage. The rest of the dishes are Restaurantware by Anchor Hocking Fire-King. Photo by David who runs the American Jadeite Collectors Facebook Group. Fantasy jadeite, on the other hand, is made to look like specific vintage pieces and is often cast from the same molds used in the past. Mosser is one such company making really nice reproductions. Target also makes reproductions, like their reproduction of the famous ball jug. 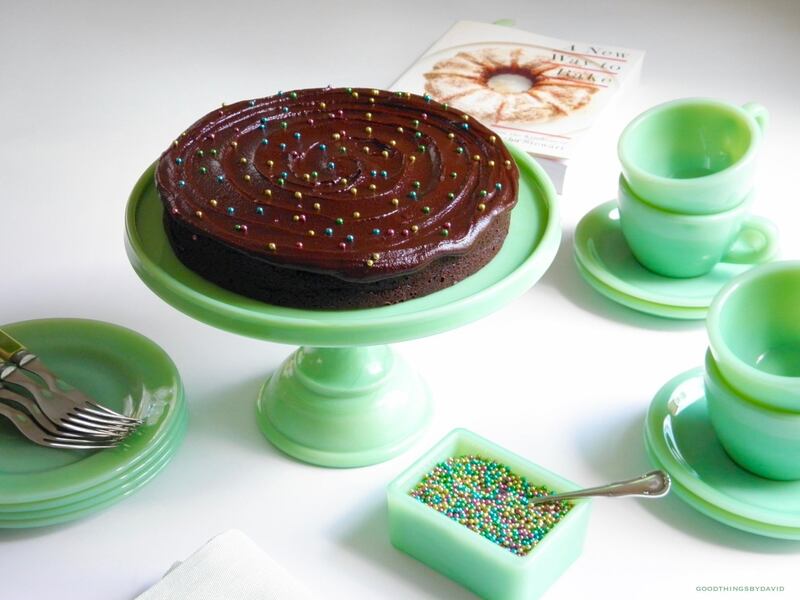 Any jadeite cake stands are new, as they weren’t made during the mid-century. How can you tell one from the other? The more familiar you are with vintage jadeite the more easily you’ll be able to spot these variations. Plus, use your common sense. 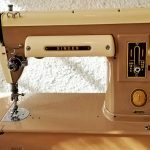 If it looks too new to be vintage, it probably is. 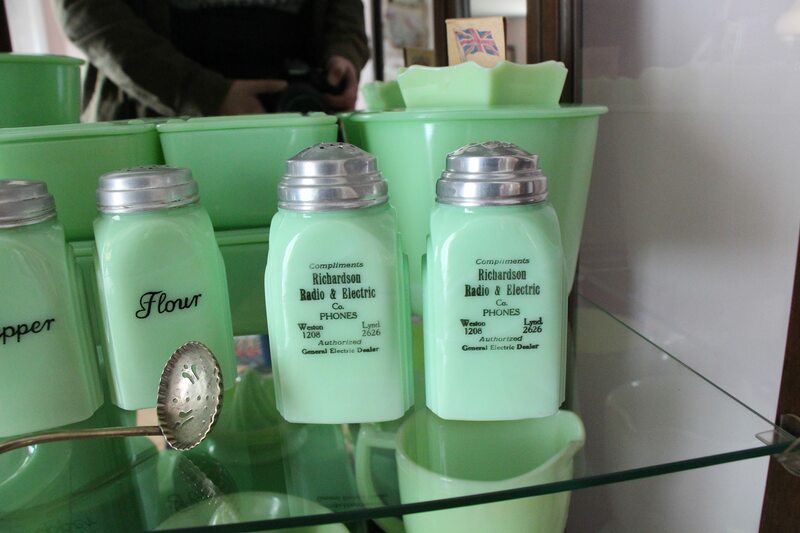 The lids are in perfect condition – a dead giveaway this is “fantasy jadeite,” a product of someone’s vintage dreams. Photo by David. Clambroth is a more translucent green glass found in both vintage and contemporary designs. Some collectors consider it jadeite, while others say no way. Clearly it looks different from the opaque look of milk glass made by McKee, Jeannette or Anchor Hocking. But if you just love the look of green glass, clambroth makes an interesting addition. Here is an assortment of jadeite pieces, including the coveted bubble bowl. The middle star-shaped piece is clambroth, which you can tell is more transluscent than the others. Photo by Megan. Clambroth glass doesn’t have the opaque milkiness genuine jadeite is known for, but as green glass goes, it’s a close cousin and complementary to both old and new pieces. 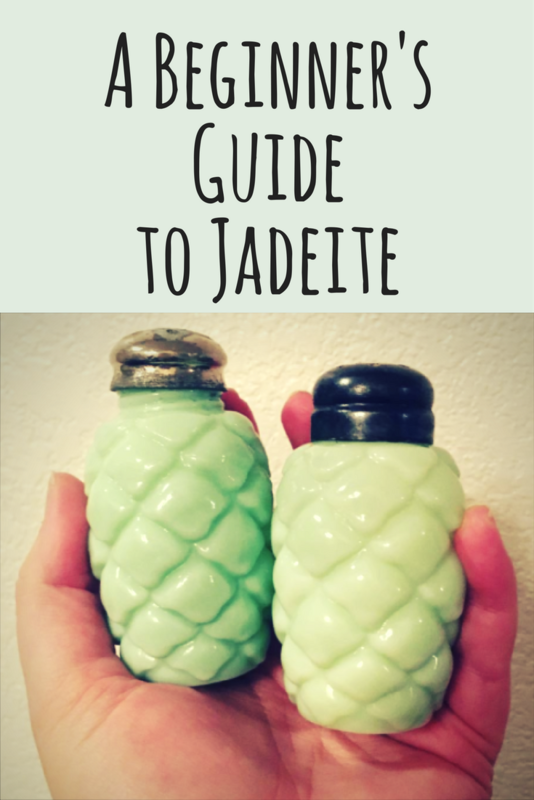 It’s easy to care for jadeite, although you can’t just stick it in the microwave. But they’re dishwasher safe (at your own risk), and most of it doesn’t crack easily. Beware when using the vintage stuff every day, however, if only because you might break pieces that can’t be replaced. Some collectors prefer to display their vintage stuff while using the newer, replaceable pieces. Others use their vintage jadeite daily without worrying or thinking twice. Fire King jadeite “in action” to serve coffee with vintage Jeannette shakers in the background – and inside that darling pink hutch! – as home decor. Photo by Laurie. Knowing the jadeite glass makers’ marks is helpful. McKee is marked with McK, Jeannette with a J in a triangle, and Anchor Hocking is marked with their signature Fire-King Oven Ware logo. However, you can’t always rely on branding since not all the pieces were marked, especially promo pieces. This is why studying and basic knowledge can help with discernment. Also, go beyond the Internet to really feel the weight of different pieces. You’ll find older pieces were heavier and more compact. The milk glass also has a certain look to it. Fun fact: McKee and Jeannette contained uranium. 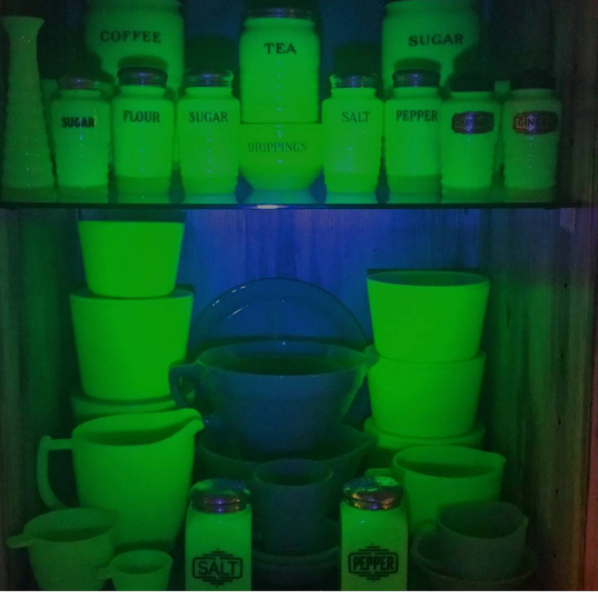 Prior to World War II it wasn’t unusual to use uranium in dishware and other household items. When the war started they needed uranium for weaponry, so companies that came later, like Anchor Hocking, couldn’t use it. Uranium glows, which is one way to discern pre-WWII pieces from the rest. One way to spot an authentic McKee or Jeannette is to shine a black light on it. If it’s real, it will glow from the uranium! Photo by Laurie, who shared this neat radiocative trick. Collecting is easy to find when you know where to look. And unlike vintage Pyrex, the market hasn’t gone completely crazy yet. Before going out and buying every green saucer you see, read up a bit on what’s out there. If you can afford it, buying the famous Keller and Ross book, Jadite: Identification and Price Guide, aka “the Bible” in collecting circles is the definitive guide to identifying makers, pieces, patterns, and value. Lurking on sites like eBay and Etsy to learn, rather than buy, is also a good way to get exposed to different pieces. Antique malls often label items, so soak up knowledge and take notes while you browse. Don’t be afraid to ask questions. Generally people enjoy talking about their collections, have read up on the subject, and are more than willing to pass along what they know. And don’t forget about estate sales! Like Pyrex, Jadeite is starting to show up more as people downsize. The signature green color is easy to spot, and estate sale liquidators will usually highlight it in ads so buyers know ahead of time if it’s there. Check our website for jadeite at estate sales or set up an alert in our daily mailer, which tells you when and where the estate sales are happening near you. Happy jadeite hunting! 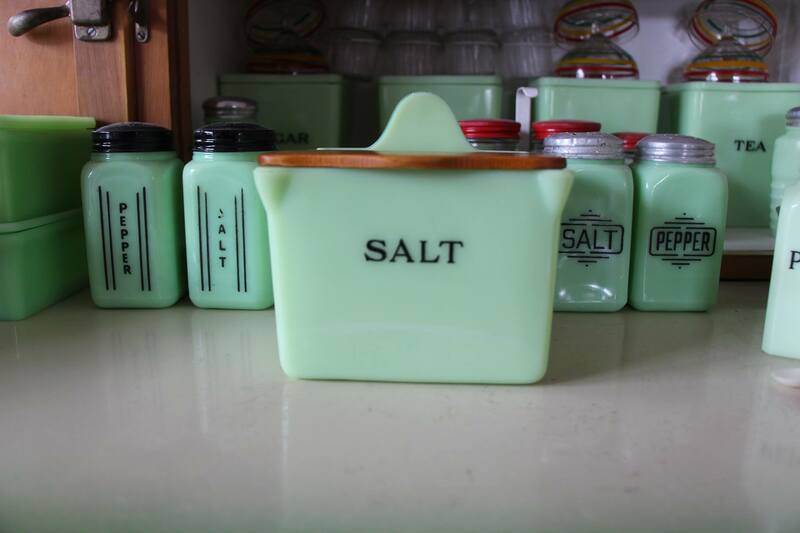 Original 1930s Jeannette Jadite Salt Box with the original wooden lid still intact. Collector Jo-Ann’s favorite piece – and we can see why! You can see some other pieces peeping in the background. Thank so much to the collectors who shared their knowledge and great photos of their beautiful collections! Visit them online and show them some love. Do you have questions or a photo of a Jadeite piece you’d love to show off? Post it in the comments below! We’d love to hear from you!